Scottish Rite has been called the “college of Freemasonry” for it’s further masonic education of the 4°-32° degrees. They are not advanced degrees beyond that of Master Mason in the Blue Lodge, instead, the Scottish Rite Freemasonry degrees are further education on the principals of the Blue Lodge. The Scottish Rite Degrees put into picturesque but explicit language the civic and social ideals implicit in the Blue Lodge Degrees. For centuries, Freemasonry has been a tremendous force for enlightenment, freedom, and social progress in Europe and in the Americas.. Your first steps into our sanctuary are duty, reflection and study. They teach us to honor those relationships to God, family, country, Masonry. The apron is white and black, with a letter “Z” and all-seeing eye. The jewel is an ivory key with the letter “Z” on the wards. The lessons of the 4o are secrecy, obedience, and fidelity. The degree teaches that honesty and trustworthiness is the cornerstone of the foundation of Masonic honor. This virtue should be in all of our undertakings. The apron is white and green, with a cubic stone and a Hebrew YOD. The jewel is a compass open on a segment of a circle, to an angle of sixty degrees. The lessons of the 5o are Honesty, Sincerity, and good Faith. In this degree we should learn duty, charity and toleration. We are told to reshape ourselves and our thinking into charity, self-control, and success. Be a peacemaker. The apron is white and red, with Hebrew letters YOD HEH in the center, and a small triangle containing the Hebrew letters (clockwise from top) BETH, NUN, and SHIN. The jewel is a gold triangle with the same three letters inscribed. We learn that impartial justice protect person, property, happiness and reputation. These degrees teach us to judge with patience and impartially. The apron is white, edged with red, with a key and five rosettes. The jewel is a golden key. We should strive for perfection by using the great principles of “God’s inherent love, charity, morality and kindness”. The apron is white, with red and green, with a balance, a five-pointed star, and a triangle with the Hebrew letters BETH (for Ben-khurim), YOU (for Jakinah), and ALEPH (for Achar). The jewel is a gold triangle with the same three letters. Scottish Rite virtues are at the very heart of this degree, truth, candor and generosity. We should use these to shape our lives and conduct. The apron is white, lined with black, and sprinkled with blood, with an arm holding a dagger, and a severed head held by the hair. The jewel is a dagger, hilt of gold and blade of silver. This degree teaches toleration of others. Everyone has the right to his own political or spiritual views. The apron is white, with a black flap, and with three arch-shaped gates — over each a head on a spike. The jewel is a dagger as in the previous degree. This degree teaches faith in moral and virtues and in God. “Life is what each man makes of it; the optimist turns a trial into a blessing. The apron is white, lined with blue and gold (symbolizing the Craft degrees), with a protractor, plain scale, sector, and compasses. The jewel is a gold triangle, with a Hebrew ALEPH on the obverse and the five types of columns on the reverse. This degree teaches liberty in our mind and our hearts, motivated by duty and honor. The apron is purple, bordered with white, and with the “Enochian delta” (hexagram with inscribed Tetragrammation) in the center. The jewel is a gold triangle with the Enochian delta on the reverse, and a scene showing two men lowering a third into a newly-discovered subterranean vault, on the obverse. In the degree we learn to reflect and look into ourselves. We should strive to be true to ourselves and our God. The apron is white silk, bordered in gold, with the Ineffable Delta in the Center. The jewel is a quadrant (compass open to ninety degrees) topped by a crown, and with a nine-pointed star on the obverse, and a five-pointed blazing star (with the Tetragrammaton) on the reverse. The compass is opened on a segment of a circle, inscribed with the numbers 3, 5, 7, 9. The degrees of the Chapter of Rose Croix are very complex. They attempt to invest the candidate with a deeper understanding of Religion, Philosophy, Ethics, and History. The intellectual challenges presented in these degrees, is at times overwhelming, and can take years to master. A thorough reading of the chapters related to them in Morals and Dogma and in the Legenda and Readings is essential to achieve even a basic comprehension of their true meaning. In this degree “we learn fidelity to obligations and perseverance of purpose under difficulties and discouragement.” The apron is of crimson velvet, edged with green, with a bleeding head above two crossed swords, and a triangle (top point to the left) with three interlaced triangles inside it. The jewel is three concentric gold triangles, with two crossed swords inside them. This degree teaches “heroism of patience, the nobility of self-sacrifice” and compassionate judgment, along with charity, fidelity and brotherhood. The apron is crimson, edged in gold and aurora-color, and with a square, shield, Delta (with three YOD’s), balance, and a hand of justice. The jewel is a mother-of-pearl lozenge, with a hand holding a balance in equipoise; under it a sword with five stars surrounding the point. On the left is a Hebrew D, on the right is a Hebrew Z. The lessons of this degree are that loyalty to God is man’s primary allegiance, and the temporal governments not founded upon God and His righteousness will inevitably fall. The apron is of yellow satin, with crimson and gold, and with a sword and Tetractys (of the Tetragrammaton) on it. The jewel is a heptagon of silver and gold, with crossed swords on a balance on the obverse, and a lamb on the Book of Seven Seals on the reverse. The jewel is hung from a double order — one black (left-to-right) and one white (right-to-left), representing good versus evil. A gold coronet is also presented. This degree teaches that life and it’s strengths come from God. The rose signifies the dawn and the cross is a sacred symbol of antiquity in many cultures. To be tolerant of others errors and faults. The apron is of white leather or satin, bordered in red, with a skull and cross-bones, a red passion cross, and three red rosettes. The grand jewel is a gold compass open on a quarter circle. A rose-cross is between the legs of the compass, and under it is a pelican, tearing its breast to feed its seven young, on the obverse, and an eagle with wings extended, on the reverse. On the circle are the letters I.N.R.I. The degrees of the Council of Kadosh are chivalric and philosophical, but also contain mystical material. The word “Kadosh” is a Hebrew word meaning “Holy”. The complexity of these degrees cannot be overstated and is exemplified by the number of pages attributed to them in Morals and Dogma. The twenty-eighth degree alone is over a quarter of the 1000+ page tome. The lessons of this degree are learned from the past and how it affects the present and the way we live in the future. We always strive to endure, produce and improve the world as it surrounds us. There is no apron, but the jewel is a gold “parallelogram” (rectangle) with a Greek Alpha on one side and an Omega on the other. This degree shows us Liberty, Fraternity and Equality. These teach moral, religious and philosophical understanding. This degree helps one to comprehend Deity, forces of nature, good and evil. The apron is yellow, bordered in blue, with three concentric point-down triangles, with the Tetragrammaton (horizontal) and “Fiat Lux” (vertical) at the center, forming a cross. Its triangular shape relates to the “fourth great light, which reminds us of the Deity and his attributes.” The jewel is gold, with the same three concentric triangles. This degree teaches, “if a job is worth doing its worth doing well”. By doing good work we improve character and become better citizens. The apron is white, bordered in purple, and contains a three-headed serpent and a table with instruments and plans on it. The jewel is an axe and handle of gold. On the top of the handle are the initials of Noah and Solomon. In the middle of the handle are the initials of Libanus and Tsidun. On the blade are the initials of Adoniram, Cyrus, Darius, Zerubbabel, Nehemiah, Ezra (on one side), and Shem, Kham, Yapheth, Moses, Ahaliab, Betselal (on the other). This degree teaches that the man who forgets his duty to God, family, country, and himself will be in danger of morally and spiritually destruction by thoughts unworthy ambition. The apron is white, bordered with red, blue, and purple ribbons. These colors, from the curtains of the Tabernacle, represent earth, fire, air, and sea, respectively, as well as the Lord’s benificence, glory, wisdom, and power. On the apron is the golden seven-branched candlestick, representing the seven planets and virtues: Sun, faith (“aspiration toward the infinite”); Moon, hope; Venus, charity; Mars, fortitude (“victory over rage and anger”); Mercury, prudence; Saturn, temperance; Jupiter (conquerer of the Titans), justice. The jewel is a small silver censer, or ornamented cup, held by a handle in the shape of an open hand. In this degree a Mason must show evidence of compassion, piety and justice. After initiation he may “manifest faithfully the social virtues in order to receive the rewards”, to serve humanity through our brotherhood. The apron is of white lambskin, with scarlet, green, and blue. On it is a violet myrtle tree, and a gold representation of an Arabian tent. The jewel is the Hebrew letter ALEPH, suspended from a violet ribbon. This degree tackles the concept of pure, celestial, eternal soul of man. He looks within his faith, life, and God and to get a clear look at his inner self. The apron is white, lined in black, and with gold stars on the white side (Pleiades, Hyades, Orion, Capella) and with silver stars on the black side (Perseus, Scorpio, Bootes). Also on it is a serpent, ouroboros, surrounding a scarab, a triangle in a glory with the Tetragrammaton in its center, and the four initials of the stars Regulus, Aldebaran, Antares, and Fomalhaut. The jewel is a gold tau cross (crux ansata) with a serpent entwined around it, and the Hebrew words HLThI (“he has suffered or been wounded”) and NChShThN (“the Brazen Serpent”) on it. In this degree we search for “the rewards of the trinity of Gods attributes – wisdom or intelligence, force or strength, harmony or beauty.” The apron is scarlet, bordered in white, with a green triangle (point-down) in the center. In the triangle are the initials of Force, Wisdom, and Harmony, and a flaming heart of gold with the initials I.H.S. (Jesus Hominum Salvator; or Imperium, Harmonia, Sapientia). The jewel is gold, and is the same triangle, suspended by a purple ribbon. This lesson of this degree teaches us to scorn selfishness, and to uphold the knightly virtues of charity, truth and honor. We should always strive to assist the poor, helpless and infirm. The apron is of scarlet lambskin, lined in black, with a Teutonic Cross (cross potent sable, charged with a smaller cross double potent or, surcharged with the escutcheon of the Empire – the two-headed black eagle) and a black key surrounded by a laurel wreath. The jewel is a gold triangle, on which the word I.R.N.I. is enameled. This degree teaches that our love for God manifests itself in our love for Truth, Justice and Nobility of Soul. The apron is white lambskin, with a vermilion pentagram. The jewel is a golden sun on the obverse, and a hemisphere, showing the northern half of the ecliptic (Taurus to Libra) and zodiac. The virtues of this degree are “Love of God, loyalty to superiors, faithful adherence to promise and active resistance to unfair judgment.” There is no apron. The jewel has two parts: on top is a gold hexagram, made of concave-outward triangles, with a compass open to 25° degrees inside it. On the bottom is suspended a gold St. Andrew’s cross (“X”), with a knight’s helmet, winged serpent ouroboros, key, and a point-down triangle. In the center of the cross is a Hebrew YOD, and on its points, clockwise from bottom, the Hebrew letters N M I N.
The lesson of this degree is to be true to ourselves, to stand for what is right and just in our lives today. To believe in God, country and ourselves. There is no apron, but the jewel is a gold Teutonic cross, enameled in red, with the letters J.’.B.’.M.’. on the obverse, and a skull transpierced by a poinard on the reverse. This degree teaches prayerful self-examination. The mistakes today should not be committed tomorrow. Simply, the daily look at ones self to learn to live with the future. No apron is worn in the Supreme Tribunal, but in inferior bodies, a white sheep-skin apron with a silver Teutonic cross may be worn. The jewel is a silver Teutonic cross. The jewel may be suspended from a white collar, with a gold triangle with a “31” inside it. But in inferior bodies it may be suspended from a golden chain, the links of which form the eight fundamental degrees of Masonry: The 1st, 2nd, 3rd, 4th, 14th, 16th, 18th, and 30. The lessons of this degree are that “genuine brotherhood requires mutual regard, opinion, esteem and charity”. We always look for the good in all, make allowances for other’s short comings. We trust the Supreme Architect to lead us to friendship, morality and brotherly love. The apron is white, lined in black, with a double-headed eagle and a plan of the Camp of the Princes. 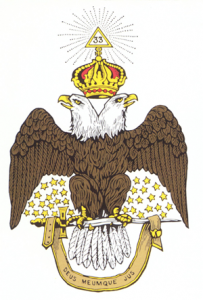 The jewel is a golden Teutonic cross, with a double-headed white and black eagle in the center. Some Valleys may not have all four divisions. In such cases, their candidates receive Council, Chapter or Consistory work in neighboring Valleys. Knight Commander of the Court of Honour, K:.C:.C:.H:. The Scottish Rite confers a number of honors upon members who have contributed extraordinary service to the Rite, to Masonry in general, and to the world at large. The first of these is the Rank and Decoration of a Knight Commander of the Court of Honour (KCCH), which may be conferred after a minimum of 46 months of membership (usually much longer) and is strictly limited in numbers. A KCCH may, after 46 months at that rank (but usually longer), receive the 33rd degree, Inspector General Honorary. This award is even more limited in numbers than the KCCH. Knight Commander of the Court of Honour: At the biennial session of the Supreme Council certain Masters of the Royal Secret, having held that degree for at least forty-six months prior to the session, are chosen to receive the Rank and Decoration of Knights Commander of the Court of Honour. These are chosen from the ranks of the Consistory for special service to Masonry, or to mankind, by the Deputy or Sovereign Grand Inspector General. The Knight Commander of the Court of Honour may be recognized by the red cap they are entitled to wear. The rank of KCCH, if petitioned or asked for, must be refused. All Scottish Rite jurisdictions nominate a select few members to receive the 33°rd Degree, Inspector General Honorary, in recognition of outstanding service to the Rite, or in public life, to the principles taught in the degrees. In the Southern Jurisdiction, the Supreme Council chooses 33rd degree members from among those who have previously received the rank and decoration of Knight Commander Court of Honor. The KCCH is bestowed in a Ceremonial of Investiture in recognition of outstanding service to the Rite, or in public life, to the principles taught in the degrees. The Thirty-third Degree is conferred by the Supreme Council upon members of the Rite in recognition of outstanding work in the Rite or in public life. The 33° cannot be asked for and if asked for must be refused. At its biennial session the Supreme Council elects members of the Rite to receive the Degree. These 33 Masons are Inspectors General honorary and honorary members of the Supreme Council. The active members of the Supreme Council are chosen from among them.